I need another project like I need a (another) hole in my head. But, with designers like these, how could I resist? I have joined the “Blockheads” sew-a-long with Betsy Chutchian, Jo Morton, Lynn Hagmeier, Lisa Bongean, Jan Patek and Carrie Nelson. It began on March 8 and will run for 48 weeks. Each Wednesday we have a new 6” block to make. The first one was by Lynne H. Here is my “Whirlygig". 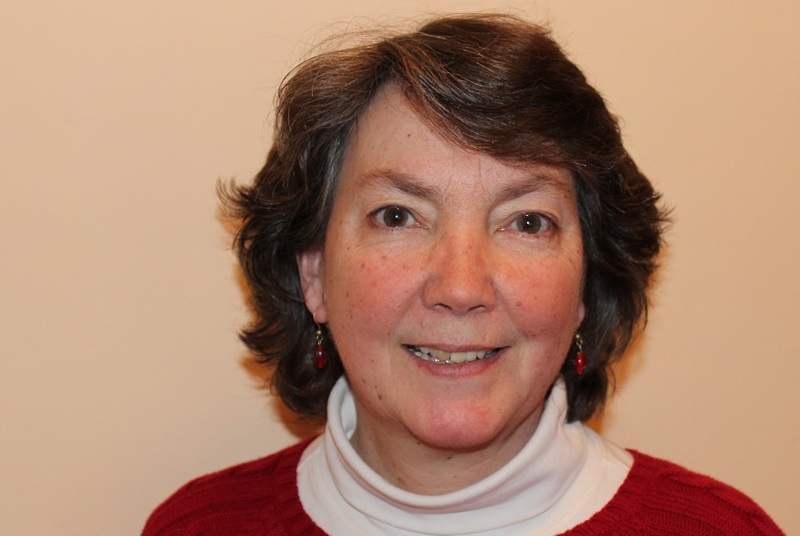 The second one, “Aunt Dinah" was from Betsy Chutchian. And last week’s was from Jo Morton “Four X". Read all about it (here). Looks like fun, doesn’t it?? 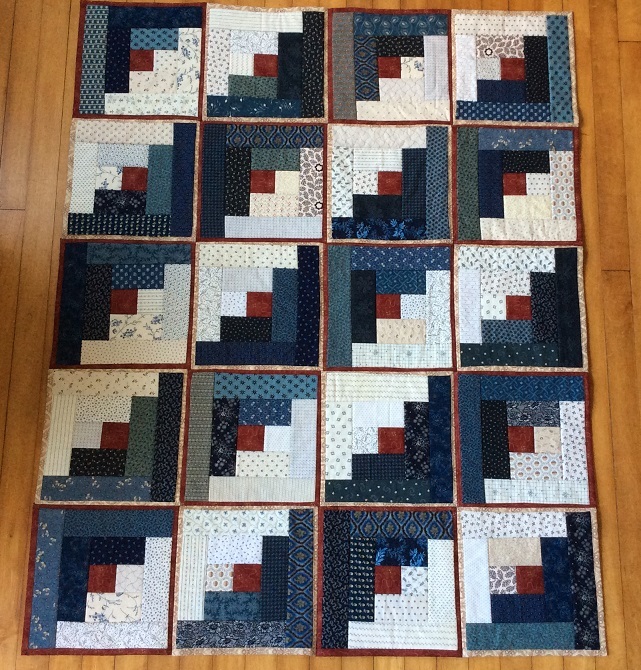 A while back Randy (Barrister’s Block) gave me some leftover blocks from one of her red, white and blue quilts. 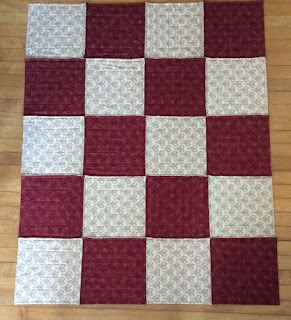 To make them fit with other blocks from my group, I trimmed them up to 6 ½” and made 12” blocks out of them. Now I have 6 more to add to my pile of “veteran’s blocks”! Thanks Randy. There were quite a few blocks at our last meeting so I plan on whipping up a few tops this weekend. Woohoo! I enjoyed this block much more than I originally thought I would. I did not like the three big leaves in the center flower at first. But, I decided to stick with Esther’s plan this time and take my chances. Perhaps because my block is so much smaller than the original, I didn’t mind the big blocky leaves after all. That center flower looked like a Trillium to me so I tried to find a print that would look more white than the gray in the original. I used this wonderful print that I often use as a background. 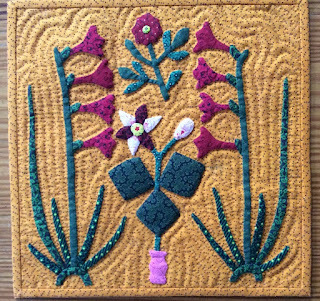 However, when I was finished with the applique I found it was too white so I took my Pigma pen and filled in more red dots (sort of hand made picotage!). I love the way it came out. I have since found out that it might be a Confederate Violet. So named because of the similarity in color to the Confederate uniform. So, my coloration is way out of whack. I still like mine and I’m sure Esther would approve even though I am a Yankee. I’m not sure what the little floaty flower on the top is, but I suspect Esther just wanted to fill the space, so I followed suit. 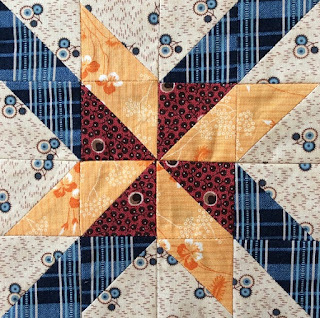 Be sure to check out all the wonderful blocks this month (here). It’s a done deal. 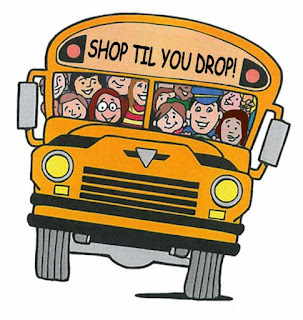 I am so excited to be able to go the AQS show in Lancaster at the end of the month. 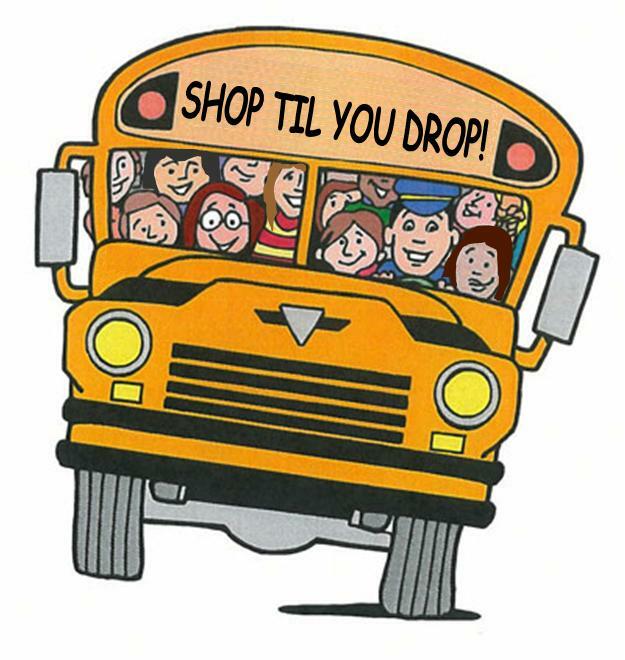 The bus will be full of crazy quilters from Maine and I’ll be rooming with a great quilting friend who has a quilt in the show! I would love to meet up with anyone from Blogland who will be attending. I don’t post many pictures of me on my blog so this is what I look like. 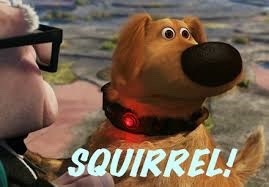 Oops, wrong picture, this is me. If you are going and want to set up a Blogland rendezvous, let me know. 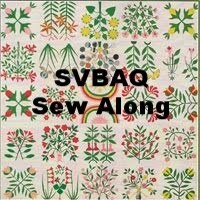 I made a statement in a recent post that I am in charge of the quilts for veterans in our local quilt group and that I try to make at least one quilt top each month. Since I had lots of “kudos” comments, I felt I needed to clarify a few things. First - I generally only make tops, because I stink at “domestic” machine quilting and I don’t own a longarm. 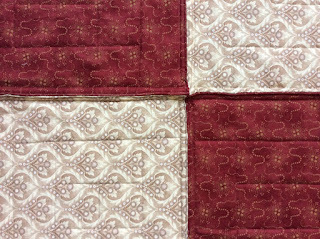 Most often they are quilted by a wonderful member of my quilt group, Sharon Patterson. She is a fireball when it comes to whipping these tops into shape. 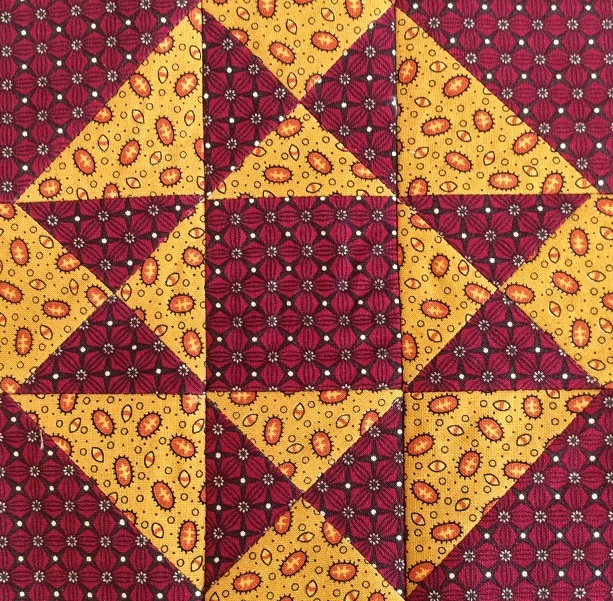 Second - Many of the tops I make are from blocks that are made by people in my group and I just assemble them and pass them on to a machine quilter. Which is why I can produce one or more a month! 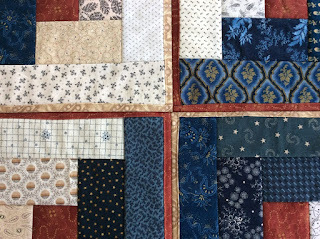 The blocks are not always perfectly pieced (or even the same size), but I enjoy the challenge of setting them all together into a quilt that I know will be appreciated by one of our veterans. Third - We don’t call ours, Quilts of Valor, because the specifications for that particular organization are quite specific and we (as a group) don’t always qualify. But, we have found numerous local Veteran’s homes and services that will take a quilt of any size so we make as many as we can. I am a very patriotic person and this project is very dear to me. 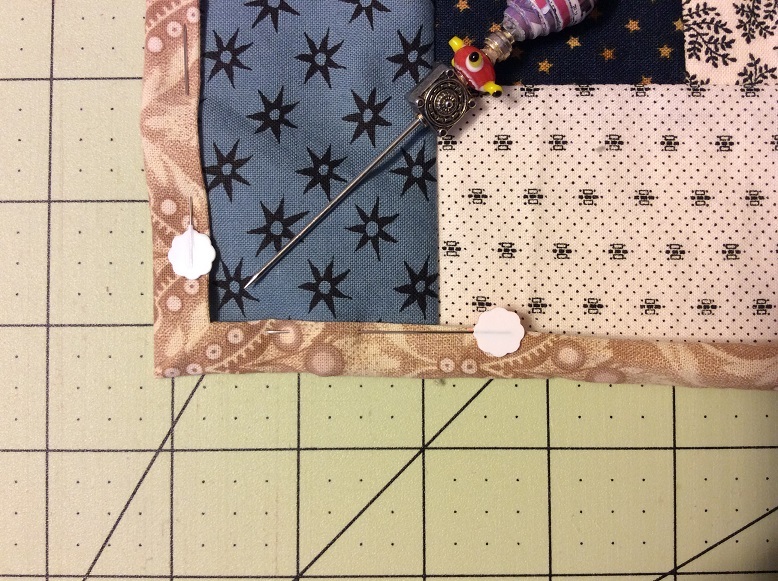 My Dad was in the Navy and I think of him every time I work on these quilts. The only downside of this responsibility is that I am not (and never have been) a fan of the color scheme, red, white and blue. However, this is a small price to pay to add a little joy to a veteran’s day. 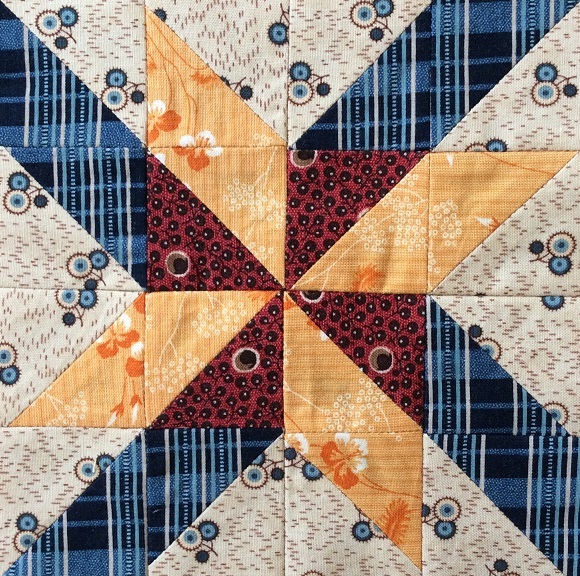 And finally – The reason you don’t see many of these quilts is that I am usually finishing one ten minutes before I have to leave for our meeting. I will try to be better about this in the future as they do deserve to be seen. Here is one I finished last night to take to Thursday’s meeting. 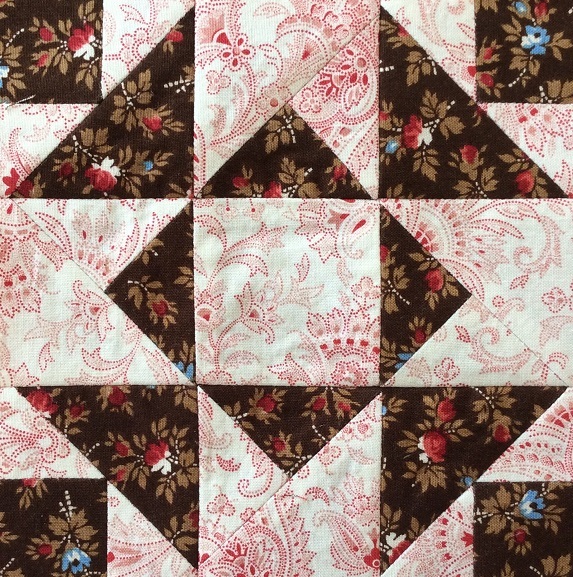 The blocks in this one were made by Donna Zimmerman and are expertly pieced. 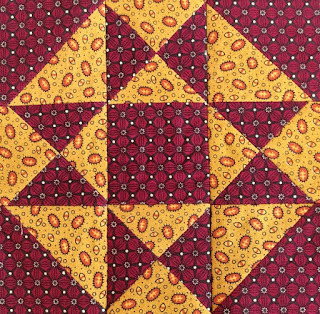 I didn’t need to trim or fudge one block! Thanks Donna. 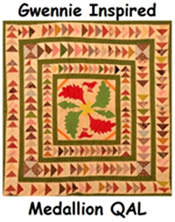 The pattern for the blocks was from Dar (Dar's Patchwork Garden). I learned about her wonderful quilts through Kevin (Kevin the Quilter) and his fantastic efforts to create quilts for veterans. 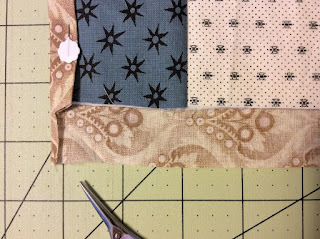 And the border fabric came from the collection of Joan LaBar. Joan was a fabulous quilter and the mother of my dear friend Laurie. Joan passed away in October and Laurie has generously been donating her fabrics to fellow quilters. I know Joan would be proud to see her fabrics being put to use for our veterans. Thanks Joan! So, you see I can't take credit for something that is truly a team effort. Thanks to all who make these quilts possible. It truly takes a village! This is the final reveal of the Log Cabin sew-a-long with Cecile (Patchwork Inspirations) and Bea (A Needle in a Haystack) . I finished mine in the potholder style. This is the first potholder quilt I have made entirely by machine. I’m not 100% happy with the outcome, but I’m pretty sure the veteran who receives it will find comfort in it. Here are a few photos of how I made my mitered corners. I trim the backing to 1" around the finished block. I pin it into place and then I cut out a section out of each corner. 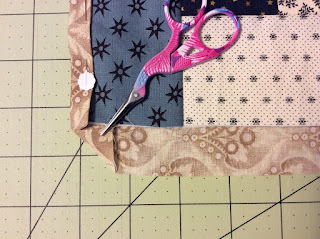 Fold in the corner to for the miter. Then just stitch around the edge. The front turned out o.k. with most of the blocks lining up. The back was a bit tricky, but as it too looks fine from 100 feet away! 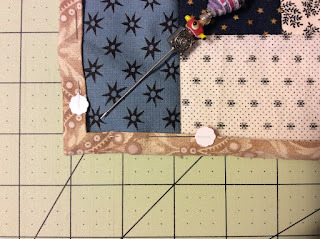 It was a quick way of getting a quilt done and I just might try to perfect my method. I try to get at least one veteran's quilt top done each month. I usually take them in to one of my group members for machine quilting. This time I felt happy that I didn't have to burden anyone with another top! I worked on this top last night. As you can see in the second photo, it has been a while since I spent any time at my machine. I hadn't changed the calendar since January! Have a great day and check in with Bea and Cecile to see the other log cabins. Rebecca in Alaska (Quilting Everyday) is the Lucky winner of the 2 ½” strips. Have fun with them! 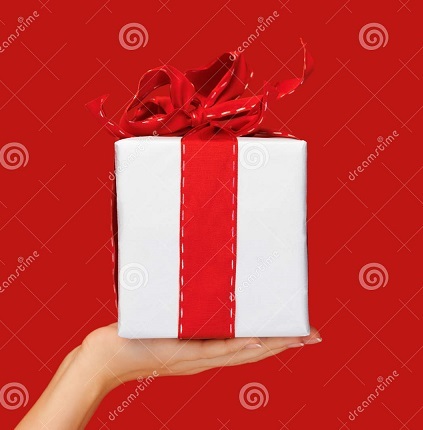 I love doing give-a-ways because of all the comments it generates. I enjoyed reading about what you would do with the strips. It seems that most of my readers enjoy making scrap quilts. I love it! I think I will call my next scrap quilt “Sourdough”! I think as quilters we all like to “pay it forward”. So, I am going to send Lori a consolation prize for such a great comment. 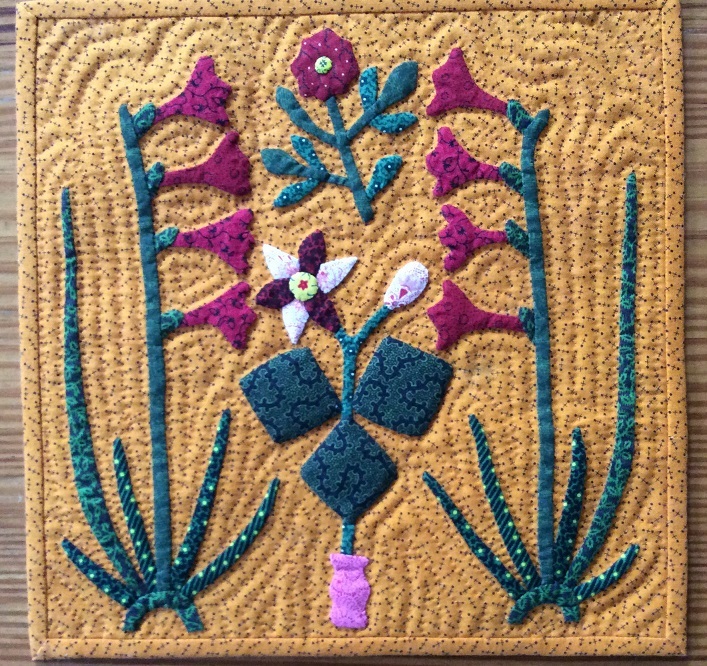 Thanks for all your comments and happy quilting.